Danny Rubenstein strengthens Vuka's™ growth plan as strategic advisor. San Diego, CA, February 27, 2018 --(PR.com)-- Vuka Energy Drinks™, a growth-oriented energy drink company focused on the healthy energy drink segment, today announced that it has appointed Danny Rubenstein as strategic advisor to help guide the company’s business and market development. Mr. Rubenstein, one of the original partners in Naked Juice and Co-Founder of DASH Advisors, is a beverage industry pioneer who has been building and advising innovative natural products and specialty food & beverage companies for the past 25 years. Danny Rubenstein has worked with notable brands like Gerber, Tazo Tea, POM Wonderful and One Natural Experience throughout his consulting career and has been engaged with VUKA Brands™ for the past 6 months. "It continues to be very enjoyable and rewarding to team up with Darian and Alexia as we work together to transform VUKA Brands™ into a very solid, scalable company – with a clear focus toward developing VUKA Energy™ into a very well-known, profitable brand. I am very confident that with the strategies that we've developed and are beginning to execute for VUKA™, coupled with the depth and strength of the team we are building, VUKA Energy™ will soon emerge as a category leader." 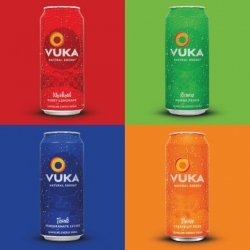 Vuka™ Natural Energy is available nationally in major retailers and a host of independent stores. In addition, consumers can buy online at http://vuka.com/store/ and on Amazon.com. About Vuka™: The mission of Vuka Energy Drinks™ is to create beverages that make natural the new normal by encouraging consumers to “wake up to what’s inside.” The 9-year-old company seeks to provide energy drink consumers with an alternative to other chemical filled energy drink offerings and is known for its bold flavors and bright cans.